Treat your guests to a stylish favor that boasts good taste! Your friends and family will enjoy sitting down to a warm, relaxing cup of black tea while recalling fond memories of your wedding, bridal shower or other event. Each single serving personalized tea bag favor is customized with the silhouette design and color of your choice along with 3 lines of text. Please tell whst kind of tea and the supplier. I ordered them and we loved them! 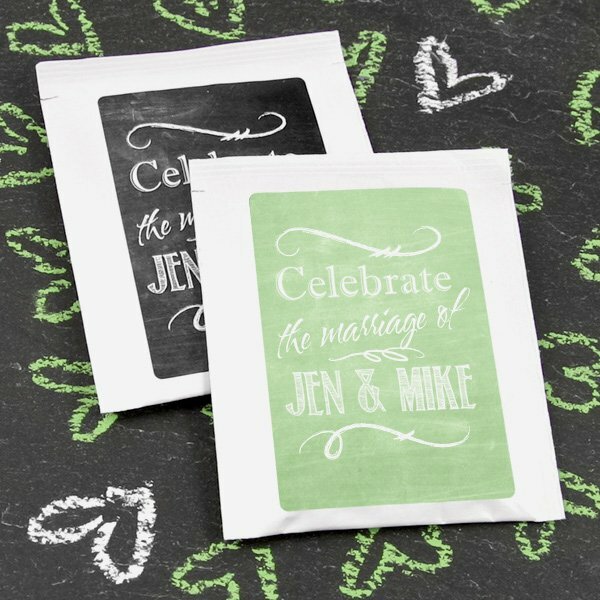 Personalized Tea Bag Favors (Many Designs) are traditional black tea bags. Can I order just Spearmint tea bags? With a custom company logo? The tea is a traditional black tea. All of the available personalization options and designs are shown on our site; we're not able to accept outside artwork/logos for the stickers at this time. I'm sorry, all of our orders ship directly from our US located suppliers to our customers; they are not available in our Boca Raton location. Hi, for your customizable tea bags, am I able to upload my own image? Or a I just limited to the text and design customizations offered via the site? The design options listed on our site are available. We're not able to accept other images, photos or logos. I would like to use these tea bags at a church function. Am I able to personalize myself? 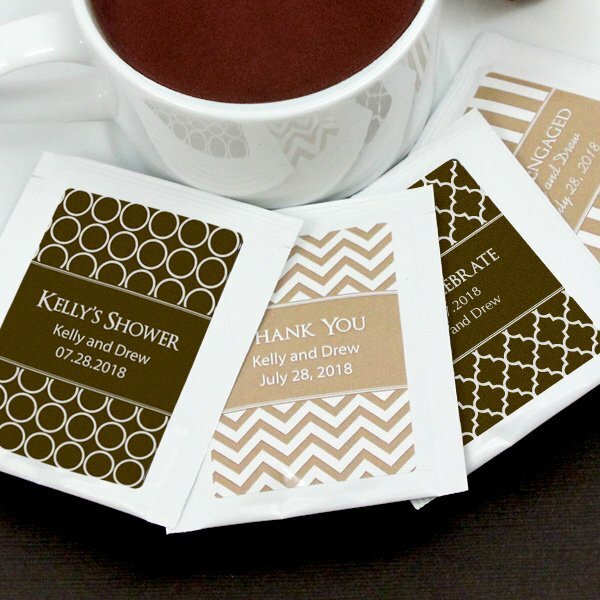 Yes, the Personalized Tea Bag Favors (Many Designs) can be personalized and you can see the design options after adding the favors to your shopping cart. Once you do that, click on the designer tool or personalize now tab. With the personalized tea bag favors do you also get the tea bag? Great! Once they're in the cart, we will then prompt you to enter your personalization selection and your specific text. What does it mean when it say assemble on the tea bags? That means assesmbly is needed for you to you manually attach the label stickers to the Personalized Tea Bag Favors. Can I have different flavors for the tea bag favor? Unfortunately, there's only one flavor available for the Personalized Tea Bag Favors which is a traditional black tea bag. Can you get peach tea instead of black tea? I'm sorry, that only comes in Black Tea. However, you can find all of our drink mix selections by clicking here. Where it says The Perfect Blend, do I list that as Text line 1? Yes, you need to add "The Perfect Blend" on text line 1 then you can add 2 more. You can right names on text line 2 and the date of the event on the text line 3. You can specify all of that after adding these Personalized Tea Bag Favors in your shopping cart. I like the personalized tea bags, but I want it for a religious event. Is this possible? Yes, we have some other designs that aren't just for weddings. You can click on the "View Designs" link on the product description to see the other designs. 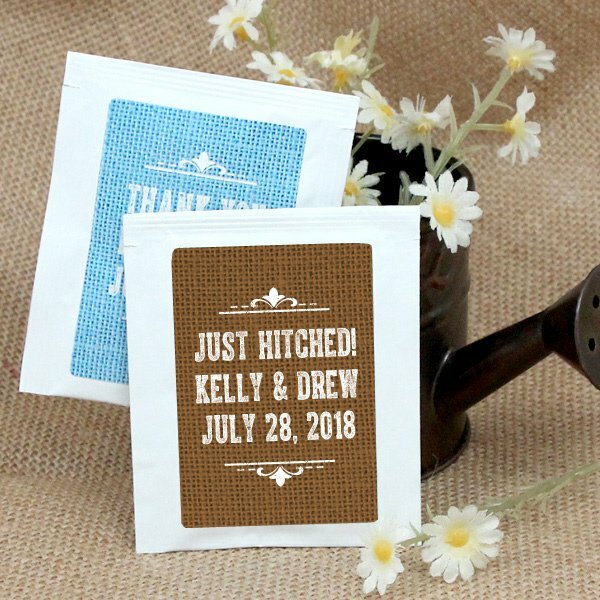 Trying to order personalized tea bags for bridal shower. When it comes to picking the design I have no idea what it is called. It is the one that is pictured on the web page, colored pink with two birds, maybe doves on it that says "the perfect blend". One of the options for design says "doves" but I have no idea if it correlates with what I wish or not. I think you're referring to the "Love Birds" design. First, you need to add the tea bags to your cart, click on complete the missing info under personalization, then scroll down and you'll see a link that says "View Design". It will open a new window and at the bottom of the sample designs you'll see the design name. On the designer tool it's blue but you can change the label color if you want it to be pink. Good Morning. Can the Umbrellas design be customized with specific colors of the umbrellas? 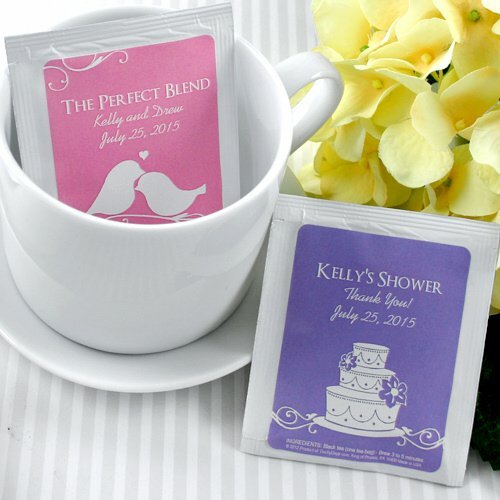 Only the label color and design of the Personalized Tea Bag Favors (Many Designs) can be customized. You can also add 3 lines of text. (Text line 1 has a maximum of 30 characters, text line 2 and 3 have a maximum of 25 characters.) If you want it pre-assembled, you can add that as well for an extra fee of $0.15. Does the tea bag come with tea? What type of tea? Yes, the Personalized Tea Bag Favors (Many Designs) comes with black tea. The tea bags have a shelf life of 2 years. Each white gloss foil-lined envelope holds one traditional black tea bag and measures about 2.5" wide x 3" tall. Easy assembly is required with self-stick labels but we can also assemble the labels for you for an extra $0.15 fee.